Chadwick Optical, Inc. Hemianopsia Eyeglass Options - Chadwick Optical, Inc. Most doctors don’t see patients with hemianopsia every day. Some see a hemianopia patient only a few times in their career. But when that patient does show up, it’s important that you are knowledgeable in the available interventions and can lead them in the right direction. While hemianopia is not technically considered a low vision condition, it should be treated as a low vision condition. It’s important to assess and prioritize the patient’s daily-living goals to ensure their treatment properly aligns with their goals. The most common concerns from these patients typically involve reading, mobility, and driving. As a manufacturer of eyeglasses, Chadwick Optical is very familiar with eyeglassess and the current research surrounding eyeglasses for hemianopsia. We don’t actively research the latest in training, rehab and technology, so we would encourage you to enlist the assistance of rehabilitation and vision therapists in developing your patient’s treatment plan. The staff at Chadwick Optical receives many hemianopia inquiries each day, and we are confident that we can help you do right by your hemianopia patient. We’ve designed this area of our site to allow doctors to refresh their knowledge on the eyeglass options available for hemianopia, and to help decide which options will work best for their patient. If you have any questions, please call us to discuss the various options. Prisms…Not Just for Double Vision. In a family optometry practice, prism is usually prescribed to correct a patient’s diplopia. When used for hemianopsia, prisms are used to relocate, reposition, and expand the patient’s visual field. For hemianopia, the goal is not to correct diplopia, but to maximize functional visual field. The different field expansion strategies can be split into four basic groups, and each of them work in completely different ways. To show how they work, it’s important to consider the wearer’s eye movements. For each of the lens designs, we show two separate overhead visual fields. The first is the patient’s field at primary gaze. The second is the patient’s field at 10 degrees gaze left. 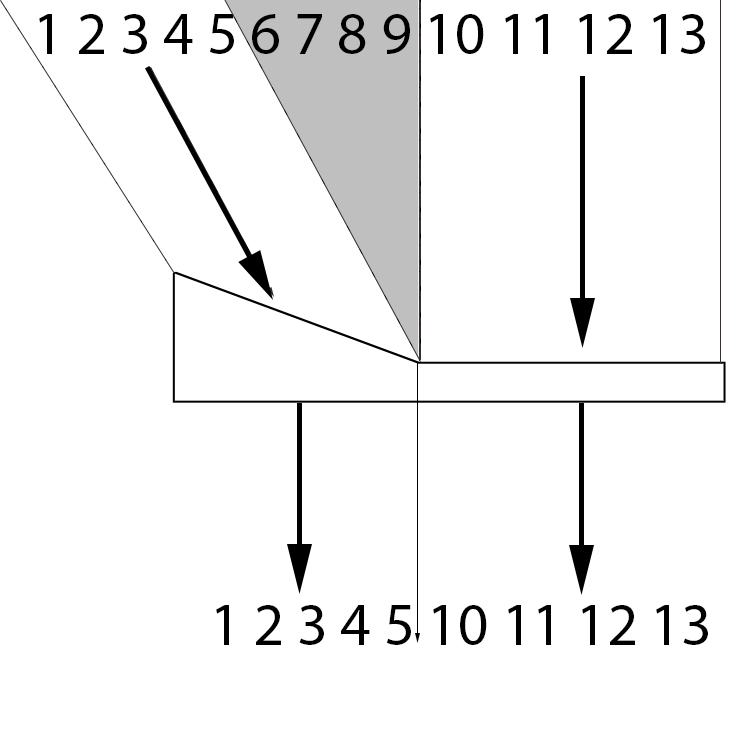 Peripheral Prisms – These prisms sit in the patients peripheral visual field, and offer information from the blind visual field. 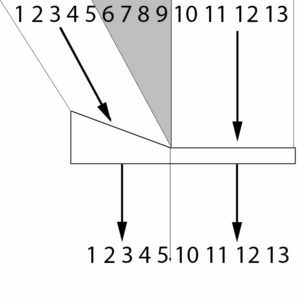 Spotting Prisms – These prisms sit in the patient’s blind field, and offer an expanded field when the patient looks into them. Yoked Spotting Prisms – These prisms sit in the patient’s blind field, and offer a field shift when the patient looks into them. Yoked Prisms – These prisms cover the entire visual field, and go in the same direction, typically the direction of the field loss. This shifts the visual field slightly towards the blind side. There is no known way to optically expand your patient’s visual field without a trade-off. Every optical intervention is going to be gaining field by taking something else away. It may take away contrast, field, or both. The goal is to minimize the effect of the trade-offs and maximize the benefits. The first trade-off to consider is an apical scotoma. At the apex of a prism, there is a field loss that is roughly the same size as the amount gained by the prism. This effect is especially apparent on the yoked spotting prisms (aka bilateral sector prisms) where the patient loses vision straight ahead, and gains a little bit out to the side. Many practitioners are reluctant to prescribe this prism configuration because of the potential dangers of having a blind spot directly in front of you. Double vision in central vision is disturbing and confusing. This is apparent when gazing into the spotting prism (aka unilateral sector prism and marketed under many other names). The field expansion is disturbing because it gives the patient double vision in their central vision. And if it doesn’t give the patient disturbing double vision, then it isn’t giving them field expansion. In some literature and advertising, this disturbing double vision is theorized to be a benefit—an annoying cue for the patient to turn their head and acknowledge their blind field. There is no known scientific proof of this claim. Central Double Vision is disturbing. Peripheral Double Vision is just confusing. The body actively revolts against the disturbing double vision of a spotting prism. When a patient looks into a spotting prism, their eye involuntarily pushes back towards the apex of the prism in an effort to fuse the disturbing image. There is no amount of training that will override this natural physiological reaction to a spotting prism. Confusing double vision does not trigger any sort of notable physiological reaction. Without the body actively fighting against it, patients can learn to appreciate the field expansion created by peripheral prisms. If your patient’s goals include having better awareness of their blind side for mobility, then fitting the patient with temporary peripheral prisms is a great place to start. There is no other option that gives a comparable benefit. Supplementing the peripheral fitting with vision training/therapy sessions have been shown to dramatically improve the patient’s awareness of the expanded visual field. You can download the fitting protocol here. If the patient’s goals include improving reading, vision therapy offers their best chance at success. Many patients hope to drive with hemianopia. Rules on driving vary from state to state, province to province, and country to country. If the state allows patients to drive with a visual field of 120 degrees or less, permanent peripheral prisms can probably help the patient meet the visual field requirement. Give us a call to discuss your specific case so we can help you determine the best course of action.